There are films that leave me wondering why a character wants what they want. This happens frequently in movies when the motives are unusual - when a character is driven to desperation by a maddening thirst for fame, say, or by the need to decapitate women who wear red shoes - but there are times when an aggressively average protagonist can seem as puzzling. With Noor, for example, I cannot for the life of me figure out why the film's heroine wants to be a journalist. 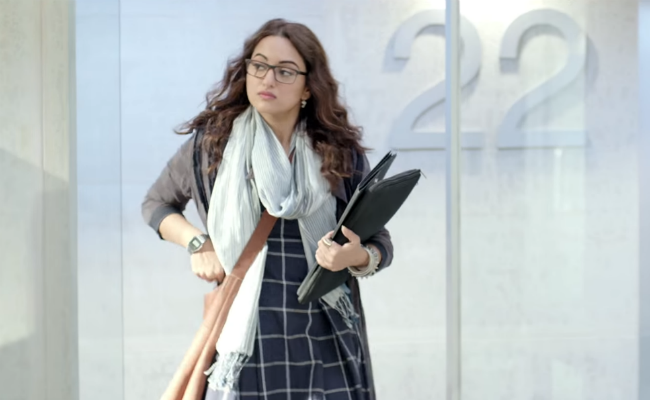 Played by Sonakshi Sinha in very Bridget Jones-y mode, Noor is a whiny character who complains about everything from boss to backside. She laments the fact that while she wants to be a serious journalist who has a stack of well-researched stories, she is handed instead the job of interviewing Sunny Leone. One day, when a potentially huge news story falls into her lap, she charges into it half-cocked, exploits a pair of witnesses, and irresponsibly takes this under-informed and one-sided story to her editor, demanding that it be broken. It does break, and the fallout is ugly.Noor is running around trying to gauge the damage when her passive, pleasant father receives a threat on the phone. Noor crumbles. Soon we have Noor cowering under blankets while Noor's father - the threatened old man - makes coffee for her and her friends. Noor's decisive next step is not to strike back with journalistic vigour or try to dig deep to unearth the truth but instead, conveniently enough, to traipse off to London and find relief in a glass of Guinness. While her father waits alone at home. She returns, emboldened, and becomes a video blogger. Or maybe she's a slam poet. She isn't a journalist, though. Which is why I wonder why she wanted to be one, in the first place. Were our television journalists poor role models and was she misguided? And why on earth was she ranting about a chance to work at serious stuff when she fled at the first sign of something that demanded conviction? These are questions entirely sidestepped by Sunhil Sippy's Noor, a skilfully photographed adaptation of Saba Imtiaz's book, Karachi, You're Killin Me. Sinha musters up a couple of sincere moments but frequently tries too hard, while her character comes across airheaded, incompetent and unlikable - which wouldn't have been a bad thing had the film gone full Legally Blonde and embraced its silliness. Alas, it doesn't. It tries to sermonise, with lines like "We're not just journalists, we're human too" tossed around by these exclusively Bengali journalists who are appallingly cavalier about how they must behave "like vultures." The film is momentarily lifted by Smita Tambe, who plays Noor's maid Malti, and the authenticity she brings to her few scenes stands in stark contrast to the film's otherwise breezy tone. Purab Kohli is relatively effortless in a measured role, believable (and believably attractive) as Noor's object of desire, while I found Shibani Dandekar quite interesting as Zaara, a confident and self-assured DJ who - unlike most people in this film - appears to know what she's doing. I'd watch a Zaara film (and, with a title like that, product-placement should make sure it's easily funded). One of the reasons the Bridget Jones films worked is that Jones, lamenting her own weight and klutziness, was visibly fat and klutzy thanks to Renee Zellweger going chubby for the part. Sinha, trimmer than ever, doesn't do the same, but it is fair to argue that Noor may still seem overweight to herself, which is surely the only bit that counts. This, it must then be said, is somewhat undermined by the fact that, during the dance numbers, Noor is all fit and nimble - as if that is still what counts. And, hey, maybe it is. One of her first complaints is that her weight in kilograms outnumbers her follower-count on Twitter. That, dear readers, is Noor's first sigh.